CGG's ReGeneration project overcomes the seismic imaging challenges of the Gippsland Basin, revealing new hydrocarbon exploration potential for the region of south-east Australia. Map of the Gippsland Basin showing location of oil and gas fields and the CGG seismic foldout line. Source: CGG. The world-class oil and gas fields of the Gippsland Basin, with original recoverable reserves of more than four billion barrels of oil and around ten trillion cubic feet of gas, were discovered following a 1962 2D seismic survey with a 19 x 27 km line spacing. Ten of the first eleven wildcat wells were successful and all the discoveries were related to a single play: porosity in top Latrobe Group clastic reservoirs below the regional seal. 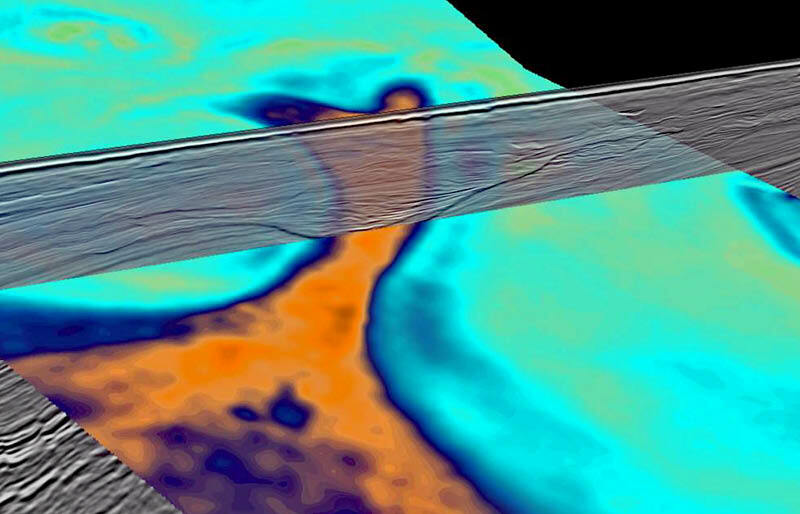 Despite considerable exploration, it has long been known that unresolved seismic depth imaging issues have had a significant impact on data quality. As a consequence, the province probably has unrealised exploration potential, particularly in the deeper stratigraphic section. The basin-wide Gippsland ReGeneration reprocessing project by CGG has changed the paradigm and the basin is now seen as rejuvenated, with new exploration opportunities and significant upside potential. The ‘elixir of youth’ was provided by new processing technologies, which have overcome the depth imaging issues that have plagued the basin since the beginning of offshore exploration in the 1960s. This seismic section was taken from GEO ExPro Vol. 16, Issue No. 1. You can download the original PDF of the issue here. Over the last ten years CGG has gained extensive experience in the processing and reprocessing of legacy datasets in the Gippsland Basin. Leveraging that experience, we recognised that further advances to our recent innovations in data processing could be critical in overcoming the imaging challenges of the basin. There are two main challenges, driven by the geology and the seafloor character. The north-western area has water depths of less than 200m, and in general a hard seabed which leads to extensive multiple generation and data contamination. The impact on data quality in this area is exacerbated by the presence of high-velocity carbonate channels in the shallow section and highly absorbing and scattering coal reflectors in the deeper stratigraphy. The eastern area has a very rugose seabed at the shelf-break, and complex velocity variations associated with high-velocity carbonate-filled channels, adding to structural imaging challenges that lead to large well mis-ties. By applying our latest improvements in velocity model building and imaging algorithms, CGG reprocessed the vintage data, to the highest level of quality, to provide the highest-fidelity depth images available for improved prospect mapping. The outstanding success of the current multi-client reprocessing project with the latest data processing technology has led to a resurgence of interest in the Gippsland Basin. The Gippsland Basin formed as a result of Mesozoic rifting and the subsequent breakup of eastern Gondwana, and hosts at least 7.5 km of Early Cretaceous to recent sediments. The main recognised units include the volcaniclastic Strzelecki Group (130–95 Ma), deposited within a continental rift; the siliciclastic Latrobe Group, initially deposited within a continental rift with a major half graben near the north boundary fault; subsequent mixed marginal marine to lower coastal plain depositional deposits; and the calcareous Seaspray Group (32 Ma to Present), deposited on a prograding continental shelf. In the early Eocene, a compressional period initiated, forming north-east to east-northeast-trending anticlines. The compression peaked in the middle Miocene, resulting in partial basin inversion. All of the major fold structures and associated hydrocarbon accumulations at the top of the Latrobe Group are related to this tectonic episode. Throughout the Tertiary there were several periods of canyon formation and infill, including a major erosional phase in the mid-Eocene which enhanced the developing structures. Minor volcanics are sporadically present throughout the entire section. These depositional and erosional elements are known to have a significant impact on seismic velocities. With regard to petroleum system elements, the primary source rock consists of Latrobe Group nonmarine, coastal plain organic-rich shale and coal (kerogen Type II/III). The main reservoir unit is the Latrobe Group marine, nearshore barrier/shoreface sandstone, and fluvio-deltaic sandstone and sandy channel-fill. The regional seal is composed of fine-grained material of the Seaspray Group with intraformational and volcanics acting as local seals. Traps include anticlines, fault closures, erosional remnants, Top Latrobe sub-crops and buttress structural/stratigraphic plays in the late Cretaceous Golden Beach and Emperor sub-groups. These subgroups are a secondary exploration target in the basin. The main phase of hydrocarbon generation and expulsion occurred in the Neogene, with an earlier phase in the latest Cretaceous/Paleocene. Vertical migration, often in excess of two kilometres, is the primary charge mechanism. Trap definition represents the key exploration challenge in the basin. 3D joint source and receiver deghosting was applied to suppress the ghost and extend the bandwidth for low and high frequencies, resulting in a step-change in resolution. Multi-passes of Full Waveform Inversion (FWI) were applied to generate a high-resolution and high-fidelity velocity model. To overcome the challenges such as poor signal-to-noise (S/N) ratio at low frequencies and limited offset in the vintage narrow-azimuth data, a hybrid FWI and tomography velocity model-building flow was applied. The FWI processing focused on resolving the velocity contrast from the shallow, high-velocity channels. The resulting tomography update focused on the low-frequency background trend and updated the anisotropic parameters. Least-squares Q pre-stack depth migration was selected as the final imaging algorithm to compensate for illumination, improve S/N ratio and recover the bandwidth and amplitudes. Figure 2: Marlin channel – new velocity model. Source: CGG. The newly reprocessed data provides greatly improved depth images, allowing for greater understanding of both the regional geology and the key exploration targets. The data provides improved definition below the thick coal seams despite the relatively short streamer length from previous acquisition. Figures 2 and 3 illustrate improved imaging of canyons and their fill, made possible with the enhanced velocity model. Figure 2 is a vertical seismic section, colour-blended with the new velocity model, which intersects the Marlin Channel overlying the Marlin field. The channel system, which ranges from 5 to 30 km in width, 75 km in length and 700m in depth, developed during a period of tectonic uplift and associated sea-level fall in the mid-Eocene. The high-velocity zone, at the base of the channel succession, is likely due to the presence of lithified fine-grained micrite. Figure 3 shows a vertical seismic section with a prominent canyon projected onto a time-slice from the velocity volume. The areal extent of the high-velocity zone at the base of the channel succession is clearly defined and highlights the complexity of the geology and associated depth imaging issues. Figure 3. Time slice – new velocity model. Source: CGG. Another key exploration challenge is the effective imaging of fluid contacts, which has long been problematic within the Gippsland Basin. Preliminary analysis of the current dataset shows that imaging of fluid contacts over a number of fields is significantly enhanced, demonstrating the opportunity for future AVO and inversion studies. Exploration opportunities identified from the reprocessing include the Top Latrobe, Intra-Latrobe, and Golden Beach and Emperor gas fields. There are very few shallow-water, Top Latrobe undrilled structures in the current dataset. 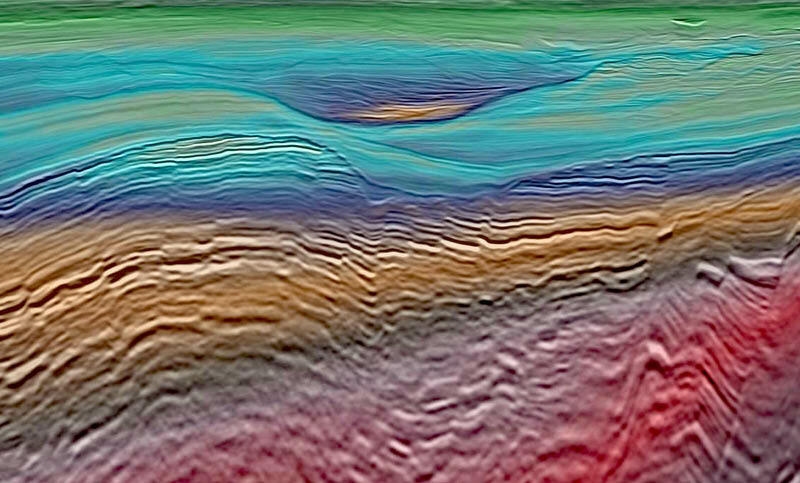 However, large undrilled features in the deepwater have been identified beneath the continental slope, where depth imaging problems have been extreme in the past. The majority of untested opportunities are expected to be found at deeper horizons. With offshore production reaching its golden anniversary this year, conventional logic would suggest that Gippsland is a ‘mature’ basin; however, because of the long-standing imaging problems, we believe that the basin still holds significant upside potential. While the reprocessed dataset is a significant improvement, the imaging is inherently constrained by the original acquisition parameters, primarily cable length. New longer-offset data would allow even better imaging, particularly in the deeper section. 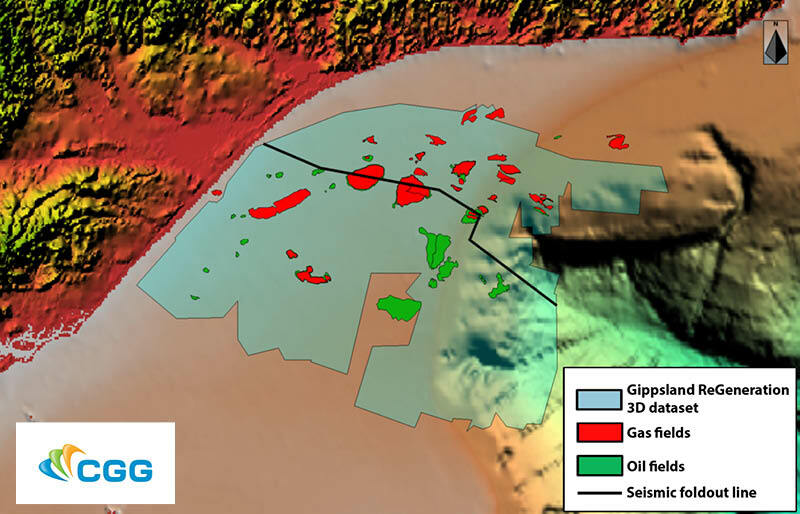 CGG therefore plans to acquire a new basin-wide 3D survey with modern broadband to produce high-resolution reservoir imaging – and provide coverage of the deeper but highly-prospective eastern canyon area. The success of the high-end reprocessing proves that even in basins that are considered mature, new ideas and processing technology can change long-held perceptions, and rejuvenate exploration activities. Images courtesy of CGG Multi-Client & New Ventures. Bernecker, T. and Partridge, A.D. (2001). Emperor and Golden Beach Subgroups: The Onset of Late Cretaceous Sedimentation in the Gippsland basin, SE Australia. Eastern Australasian Basins Symposium 2001 - A Refocused Energy Perspective for the Future, 391–402. Boddard, J.M., Wall, V J., and Kanen, R.A. (1986). Lithostratigraphic and depositional architecture of the Latrobe Group, offshore Gippsland Basin. In Second South-eastern Australia Oil Exploration Symposium (Ed. R.C. Glenie), 113 –136: PESA Symposium: Melbourne. Holdgate, G.R., Wallace, M.W., Daniels, J., Gallagher, S.J., Keene, J.B. & Smith, A.J. 2000. Controls on Seaspray Group sonic velocities in the Gippsland Basin—a multi -disciplinary approach to the canyon velocity problem. APPEA Journal, 295–313. Johnstone, E.M., Jenkins, C.C. and Moore, M.A. (2001). An Integrated Structural and Palaeogeographic Investigation of Eocene Erosional Events and Related Hydrocarbon Potential in the Gippsland Basin. Eastern Australasian Basins Symposium 2001 - A Refocused Energy Perspective for the Future, 403–412. Malek,R. and Mehin,K. (1998). Oil and Gas Resources of Victoria. Department of Natural Resources and Environment. Moore, P.S., Burns, D.J., Emmett, J.K. and Guthrie, D.A. (1992). Integrated source, maturation and migration analysis, Gippsland basin, Australia. The APEA Journal 32, 313–324. Power, M.R., Hill, K.C., Hoffman, N., Bernecker, T. and Norvick, M. (2001). The Structural and Tectonic Evolution of the Gippsland Basin: Results from 2D Section Balancing and 3D Structural Modelling - Hydrocarbon Implications. Eastern Australasian Basins Symposium 2001 - A Refocused Energy Perspective for the Future, 499–506. Rahmanian, V.D., Moore, P.S., Mudge, W.J. and Spring, D.E. (1990). Sequence stratigraphy and the habitat of hydrocarbons, Gippsland Basin, Australia, Geological Society of London, Special Publication 50, 525-541. Some recommended GEO ExPro articles relating to, or similar in content to oil and gas exploration activity in Australia. A fresh look at a clearer image: new PSTM data reveals significant exploration potential of the Cuba Exclusive Economic Zone (CEEZ).